Thank you for letting me introduce myself. 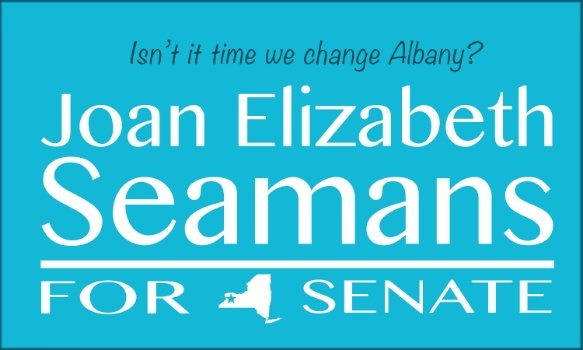 I am Joan Elizabeth Seamans a wife, mother, business owner, community activist and a strong, compassionate woman who is ready to bring back decency and accountability to government. The challenges Western New Yorkers are facing require a leader who understands moderation, problem-solving and true representation of the people she serves. Western New Yorkers are crying out for a government that works for them and a representative whose loyalty is to them and them alone. I was raised in a home with eight children. Although the financial hardships were challenging, we persevered. My parent's values shaped me in many ways. My dear, 91 year old father, a WWII Navy Vet, is a lifelong Republican. My mother, who passed, was a lifelong Democrat. I remember selling candy, cupcakes and handmade items in school to buy the clothes or shoes my family could not afford while at the same time learning from my mother the importance of helping those who had even less than we did. Understanding self-sufficiency while offering others the opportunity to thrive is ingrained in my core beliefs. Because my family could not afford to send me to college, I entered the workforce immediately. Like many young women, I was subjected to inappropriate physical advances and blatant income inequality. That and my entrepreneurial spirit lead me to build a business that has been supporting my family and providing jobs for over thirty years. In a way, my life has become the American dream. Over the years I have been compelled to serve. I served in government as a Trustee where I was a champion for fiscal responsibility and ethics. For four years I worked with families whose children suffered from addiction and behavioral issues. In addition, I spent six years working with some of our community's poorest senior citizens. In the business world, I currently serve on the Public Policy Committee for NAWBO (National Association of Women Business Owners), the Amherst MWBE (Minority Women and Business Enterprise) and the Amherst Chamber of Commerce. Previously, I served as President of the Williamsville Business and Professional Association. My political activism has been far-reaching as the founder of Your Voice Your Vote, by encouraging civic engagement and education about political and legislative issues. I will use my lifelong experience and my innate ability to listen and problem solve as your Representative. You see, it is time to stop fighting. It is time to come together as Americans, not political factions, for the greater good of our wonderful communities. Despite our differences, there are so many things we have in common…the American dream. Imagine opportunities to work hard, thrive and know our children will have a better life than our own. Imagine an economy that works for our district, not the wealthiest. Imagine a Representative who has no political ambition, instead, only a desire to put her fellow New Yorkers first. This is possible. With your support, I know we can do this together.